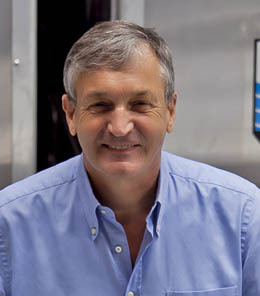 Boud Van Rompay is the founder and CEO of Hydrex, a world leader in underwater repair and maintenance technology since 1973. As a pioneer in underwater repair technology, Boud Van Rompay developed and patented many advanced procedures now in general use. Seeing the degree of marine pollution and the rough hull conditions which accompany conventional underwater hull coatings and antifouling systems, Boud Van Rompay developed Ecospeed, a non-toxic, non-polluting ship hull coating system now in use in major shipping companies. Hydrex is in the process of developing new technology to help clean up ocean pollution and contamination worldwide as well as tidal turbine technology. Boud is a citizen of Belgium and the USA and divides his time mainly between the Hydrex offices in Antwerp, Belgium and Tampa Bay, Florida.